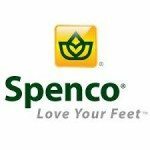 February 6, 2015 — Spenco, a company known primarily for its advanced insoles, will introduce an expanded line of stylish, supportive footwear in spring 2015. The new spring line of shoes and sandals will offer an unprecedented variety of styles, particularly for women. The “Crackle” and “Nightlight” athletic slides capture the bright, rich color trend popular in footwear. Other sandal styles offer metallic embellishments, reptilian textures, Roman-inspired straps, or feminine, floral patterns. Also, for the first time, two new wedge silhouettes will have a slight heel lift, supporting a dressier look. The men’s line will also reflect an infusion of color, with popular styles sporting colors, such as olive and navy blue. Many shoe manufacturers build the shoe first and then insert a flat insole. Spenco footwear with Total Support technology builds the shoe around an orthotic insole. It offers features such as deep heel cupping to cradle the heel and align the foot, as well as an orthotic-grade arch. The shoes retail for $49.99–$99.99 and will be available at running stores and on the Spenco website.